The agreement with Macedonia in the name dispute has thrown the Coalition in Athens into serious problems. A vote of confidence survived Premier Tsipras in the evening. Athens. Greek Prime Minister Alexis Tsipras can continue to govern. The parliament in Athens pronounced his confidence on Wednesday evening. As the parliamentary committee announced, 151 MPs voted for Tsipras. 148 were therefore against it. Cause of the heated minds is the Macedonian name issue, the Prespa agreement, which is to solve the name dispute between Greece and its northern neighbor. The agreement was also the trigger of the government crisis. After being ratified by the Macedonian Parliament last Friday, Panos Kammenos, head of the right-wing populist Independent Greeks (Anel) and junior partner in the government, resigned as Minister of Defense in Greece. He also deprived the government of its confidence to prevent the final ratification of the agreement in Parliament. Tsipras then asked the question of trust. Irrespective of this, the Prespa agreement will be put to the vote at the end of January. The required simple majority for ratification is likely, despite threats against parliamentarians who are in favor of the agreement. 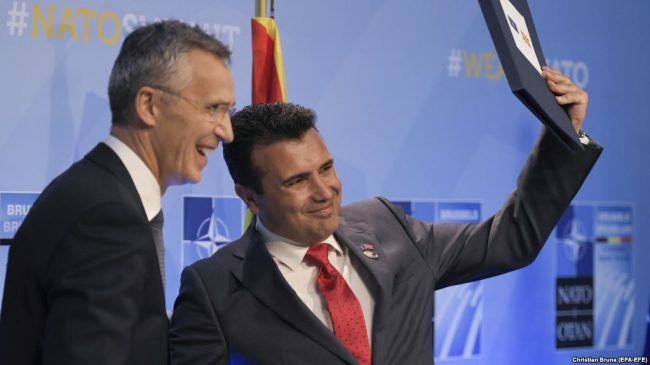 The agreement is unpopular, two-thirds of Greeks are, according to surveys against the solution, that the neighbor should now be called North Macedonia. For the Greek nationalists, this equals a usurpation of the ancient Greek-Macedonian heritage. For the opposition, the dissolution of the coalition is only a “staging”. Indeed, an end to the sharply criticized “marriage of convenience” of the left Tsipras with the right-wing populists in view of the elections is beneficial for both sides. Tsipras helps polarizing around the Macedonian issue to motivate his many undecided voters for a ballot and in the left center for new followers to fish. Kammenos can now freely as “Macedonia fighters” to win voters to the right of his party.